Social networking sites is playing very big role in today’s world. Through social networking sites we are able connect to our friends and colleagues. Many people use the social networking sites for marketing also. School and college going boys and girls are so much crazy about social networking sites. As per survey people are spending daily at-least two hours on social networking sites. Facebook and Twitter is so much popular today. Barak Obama also used social networking sites so effectively. Many political updates also we can get from social networking sites. 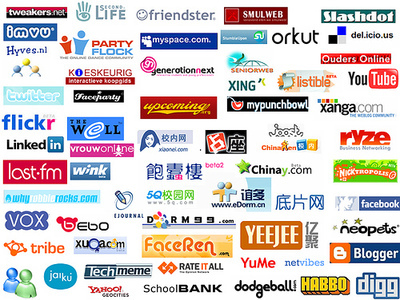 Llist of most famous social networking sites which are famous in 2011. Facebook. One of the largest and most recognized brands on the web, Facebook is a great way to connect with customers and now even sell goods and services to over 600 million users. Twitter. The widely used social networking and microblogging service with approximately 200 million users that helps keep your business in touch with its clients and customers 140 characters at a time. MySpace. Although struggling in recent years, this is still a powerful way to connect with its approximately 34 million users. Ning. Create your own custom social network for your brand, a product, a service or anything else you want and interact with these 10 million users. Tagged. This teenage-to-young adult demographic social network focuses on meeting other people with shared interests and gaming, and is formidable in size with approximately 100 million registered users. MyYearbook. Another teen-oriented social network, MyYearbook’s users interact and use MyYearbook’s virtual currency to send each other virtual gifts and play games, with approximately 5.4 million visitors monthly, around the globe. Meetup. Facilitates its users with common interests to find each other online through the social network and then facilitate an actual meeting offline. Users enter a zip code and a topic they want to meet about and Meetup helps arrange a place and time to meet. Bebo. Short for “blog early, blog often,” Bebo allows users to share just about anything on the web with their selected friends. Multiply. The biggest “social shop” in Southeast Asia with 125,000 participating merchants and a reported 20 million visitors a month, with around 3.5 million from the United States. Orkut. Google’s proprietary social network, and although less well known in the United States, it is popular internationally primarily in India and Brazil with approximately 100 million users worldwide. Skyrock. One of the largest global social networks and is predominantly occupied by teens; very popular with the French-speaking world. Badoo. Mostly popular in Europe and Latin American but has a significant following in the U.S., for chatting and sharing with friends around the world. StumbleUpon. Helps spread your content virally to your StumbleUpon friends and other like-minded people — integrates with other social networks, such as Facebook. Delicious. The popular social bookmarking service for storing and sharing favorite web pages. Foursquare. One of the big geo-location services; it can be built into other websites and social services. MyOpera. The popular browser’s blog community; serves as a hub for Facebook and Twitter contacts as well as a place to share with the Opera friend community. Kiwibox. Part social network, part online magazine, Kiwibox has approximately 2 million users worldwide and is predominantly used by teens. Hi5. A general social network modeled after Facebook; popular in India, Mongolia, Thailand, Latin America, Africa and Eastern Europe. Flickr. Well-known social photo sharing site. Fotki. A social photo-sharing site similar to Flickr but popular in Europe, Eastern Europe and Asia. Fotolog. Another photo sharing and photo blogging social network that is mostly popular in Spain and South America but gaining influence in the U.S. with approximately 20 million users. Last.FM. A social network for music fans — keeps track of what users listen to and posts those lists to other integrated social networks like Facebook; approximately 30 million users. Buzznet. A music and pop culture social network that allows users to participate in online communities created around ideas, events and areas of interest around music and pop culture. ReverbNation. A social hub for independent musicians, producers and music venues to share and communicate. Cross.TV. A Christian, family-centered social network with a user interface similar to that of Facebook. WeRead. A community of book enthusiasts that share and find new books and readers of similar interest. Flixter. A movie-enthusiasts social network — suggest, discuss and share movies with friends. GaiaOnline. A social network for gamers to share tips, strategy secrets and meet other video gamers and can be integrated with an existing Facebook account. BlackPlanet. The largest social network for African-Americans with close to 20 million users. Care2. A network for activists to connect from around the world with a membership of approximately 15 million users. CaringBridge. Designed for families or friends that want to set up a social hub for a crisis and want to post and share updates about the issue to a large community. DeviantART. A social network for fine artists designed to showcase and share their work. ibibo. Short for “I build, I bond,” Ibibo is a video gamers social network popular in India that offers many games to play online. VampireFreaks. From teens to adults, this is a social network similar to Facebook but entirely for the Goth subculture with approximately 2 million users. CafeMom. A network for moms to blog, share stories of motherhood and parenthood, find like-minded moms and more. Ravelry. A social community for knitters and crochet-hobbyists and professionals. ASmallWorld. An invite-only worldwide network for socialites and the very wealthy. Wayn. A travel network to meet like-minded global nomads with approximately 10 million users. CouchSurfing. For travelers who are interested in alternative and affordable travel, CouchSurfing is a social network to meet people who will open up their homes and couches to travelers. TravBuddy. Another travelers network for users to share reviews, tips and photos. Cellufun. A mobile social network for mobile game enthusiasts to meet other mobile gamers and play games with them. MocoSpace. A mobile-device-enthusiasts social network to find and share with like-minded friends. ItsMy. Mobile gaming social network — connect with friends, play games and more. Stickam. A live video streaming social network, where users share via video, instant message and more with close to 8 million users. FunnyOrDie. A comedy video network where users can rate and share videos with like-minded friends and post their own videos. YouTube. The most well known video sharing site where users can share and view videos, set up hubs for their own content and more. Classmates. Now a part of Memory Lane, a vintage video and news sharing service, Classmates allows for users to connect with school friends from the past. MyLife. Formerly Reunion.com, MyLife helps users find old friends, relatives, former workmates and more with approximately 30 million members. MyHeritage. A social family tree – share photos, comments and genealogy with your family. Geni. Another social family tree network for families to have an online hub for all their relatives to find and interact with one another. LinkedIn. The largest social network for professionals, LinkedIn has approximately 100 million users. Focus. A different kind of social network for business professionals to meet and post questions and get them answered by industry leaders. Viadeo. Mostly popular in western Europe and founded in France, Viadeo is popular amongst European business owners, entrepreneurs and managers in wide range of industries with close to 35 million members globally. Ryze. A smaller business professional’s social network whose prime focus is to help like-minded entrepreneurs find one another. XING. A social platform similar to LinkedIn but mostly utilized by the business communities of China and Europe — features closed communities so members of major, global corporations can have private interaction online. WeeWorld. Expressly for pre-teens and teenagers aged 10 to 17, WeeWorld is virtual world where users have an online avatar and interact in an online video game world together. Users can communicate together in real time, make friends, join groups and explore the virtual video game world. Habbo. A teenaged-oriented social network with approximately 200 million registered users, where teens join groups called “hotels,” customize the look and feel of their hotels and interact with liked-minded friends around the world with their Habbo virtual avatars. Tuenti. Spanish-based social network for university and high school students — mostly used in Spain but popular amongst global Spanish-speaking youth. WordPress. A WordPress blogging community – set up a WordPress blog, find like-minded friends and follow their blogs, leave comments and more. Tumblr. Popular microblogging social community — create posts, share them with other Tumblr users and follow other users’ posts. Can be integrated with other social networks like Twitter and Facebook. Xanga. A blogging community with approximately 40 million users that post audio, video, images and words — find friends, follow their blogs, leave comments and more. OpenDiary. One of the first social networks dedicated to blogging, OpenDiary allows users to set up a diary blog, share their thoughts, follow other diary writers and leave comments. Mixi. Japan’s answer to Facebook — very popular in Japan and invitation-only with 25 million users. QZone. A very popular general-use social network in mainland China, boasting nearly 200 million users. Douban. Another Chinese social network for fans of movies, books and music with about 10 million registered users. Renren. Designed to be similar to Facebook, Renren is popular amongst China’s college students with 160 million users. VKontakte. A Russian social network that has a similar look and feel to that of Facebook — create a profile, share with friends, send private messages, join groups and share files with its over 135 million users. Odnoklassniki. The Russian equivalent to Classmates.com — a place for Russians to find lost school friends. NK. A Polish social network for high school and college students to meet and share — approximately 11 million users. Hyves. Netherlands’ answer to Facebook — a general social network to share and find friends, with approximately 11 million users. Netlog. Formerly known as Facebox and Redbox and very popular — with around 70 million users — Netlog is mostly used by the youth of Europe, Quebec, Turkey and the Middle East. StudiVZ. Based in Germany, StudiVZ is a social network mostly used by European college students with close to 15 million users. Sonico. Latin American social network but also popular in Spain and Portugal, Sonico is very similar to Facebook — create a profile, add friends, share thoughts, videos and images and play online games. Friendster. All-but-forgotten in the United States, Friendster is still around and still popular in Asia with 115 million users and is similar in design and structure to Facebook.